We chose this name for our website to illustrate how much chimney sweeping has evolved with today’s technology. Today’s tighter; more efficient homes pose new and unique challenges for all combustion appliances. We’ve sealed our houses so well to conserve energy that combustion appliances now struggle to find enough air to burn efficiently and carry exhaust from the house. 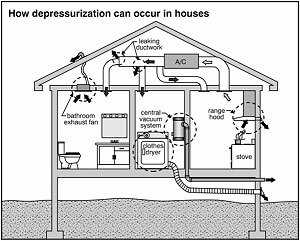 Mechanical devices such as exhaust fans and clothes dryers can rapidly depressurize your house enough to cause natural draft appliances like water heaters, furnaces, wood stoves and fireplaces to spill exhaust into your home! The plastic bag in this picture illustrates the problem. 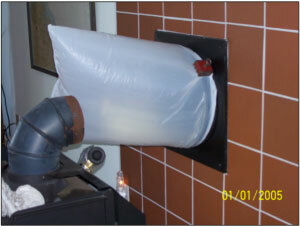 Air is being pulled down the wood stove chimney by a mechanical fan in the house and inflating the bag. This made starting the fire in the stove difficult, and caused smoke to spill into the house! As a result of these and other issues we have evolved! Bob Priesing, owner/operator of Havelock’s Chimney & Venting, Inc. has had extensive training through the Chimney Safety Institute of America (CSIA), the Building Performance Institute (BPI) and the Indoor Air Quality Association (IAQA). This training uniquely qualifies Bob to address the house as a system, and address these issues. Do you have questions about combustion appliances and air quality issues in your home? Give us a call! Havelock’s Chimney & Venting, Inc.